My old neighborhood church in Brooklyn, Our Lady of Loretto is apparently being slated for demolition, as the Roman Catholic Diocese of Brooklyn has decided that Our Lady of Loretto is no longer worthy of remaining open and will surrender the property to the City of New York which has plans to demolish the church. 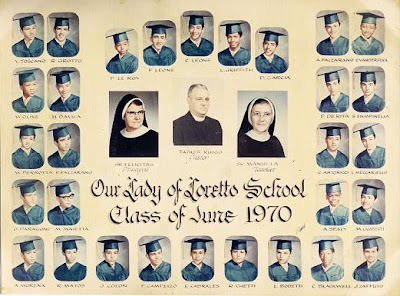 You can help by signing a petition here to declare Loretto a historical landmark; please sign it here. The church was built originally by Italian immigrants who lived in the neighborhood, not by the Catholic Church. Check out these mugs and see if you can find me in the class of 1970.